If you select join before host, then the participants can join the meeting before the host joins or without the host. If you do not select join before host, the participants will see a pop up dialog that says "The meeting is waiting for the host to join." 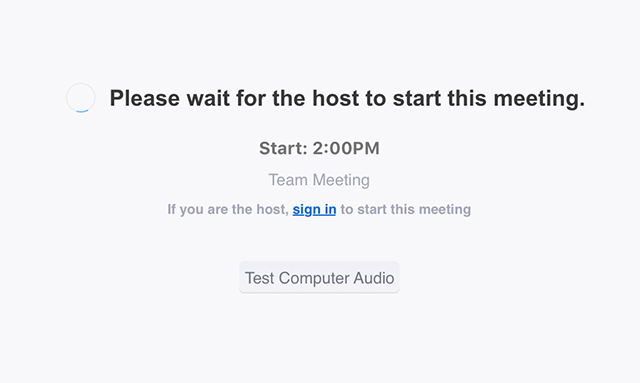 If you are the host, there is a login button to login and start the meeting as the host. If you turn on Join Before Host for all members on your organization, it will be on by default for any newly scheduled meetings, but members will be able to uncheck it when scheduling a meeting. To force this setting on for all meetings, you will need to lock the setting. Navigate to the Meeting tab and verify that the Join Before Host setting is enabled. If you turn on Join Before Host for all members of a specific group, it will be on by default for any newly scheduled meetings, but members will be able to uncheck it when scheduling a meeting. To force this setting on for all meetings, you will need to lock the setting. If you turn on Join Before Host in your meeting settings, it will be on by default for any newly scheduled meetings, but you will be able to uncheck it when scheduling a meeting. Navigate to the Join Before Host option on the Meeting tab and verify that the setting is enabled. Open your Zoom application and login to Zoom. This will open the scheduler window where you can select your meeting settings. Check Enable join before host. Note: You can also turn on Join Before Host for any scheduled meeting. Click Meetings at the bottom of the Zoom application. Hover over the meeting you want to turn it on for and click on Edit. Click Advanced Options, check Enable Join Before Host and click Save. Under Meeting Options, check Enable Join Before Host. Note: You can also turn on Join Before Host for any scheduled meeting. Go to My Meetings. Click on the Meeting Topic. Click on Edit this Meeting. Check Enable Join Before Host. Click Save. Begin by logging into the Zoom application and selecting Schedule. Toggle Allow join before host to on. Click Done to finish scheduling. Login to the Zoom app on your iOS device. You will then be able to choose your Meeting Settings, including date and time. If the host does not join the meeting or is not logged in when joining, there are no host controls such as recording, mute/unmute all, lock meeting or remove attendees. When Join Before Host is on, the host can join the meeting without being logged in. If you are the host, but do not have host controls such as recording, leave the meeting and login in the Zoom application. Start the meeting again from your Meetings list. If started by a Zoom Room, the second meeting will start and close the first meeting without warning. If started by the host, they will have the option to close the first meeting and start the second. If started by a participant, they will receive a message that the host has another meeting in progress. If Waiting Room is turned on in your meeting settings, Join Before Host will not work for your meetings. If you would like the meeting to be recorded without the host attending, you will need to turn on Automatic Cloud recording for the meeting. Can my participants join even if I can't attend? Can a meeting start without the host?